Take a look through some of our recent projects. You can filter by project type by clicking on the main tabs below. Heil and Andrews Construction had little focus on the web prior to their current website. 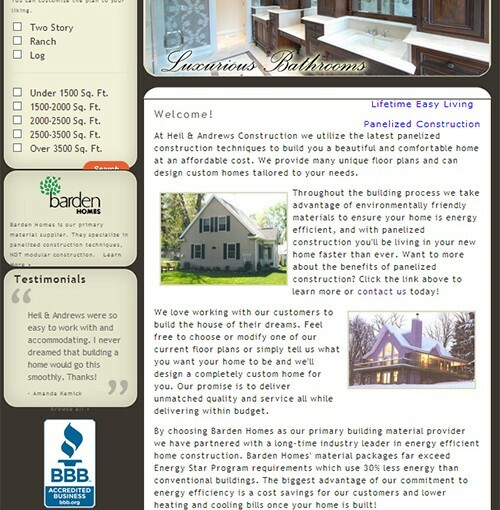 Their website displays and allows visitors to search for Barden floor plans based on specifics they are looking for. The website generates several quality leads each week as a result of the landing pages for each floor plan and the SEO strategy! Whether you're ready to take advantage of Inbound Marketing for your business or you just have a question, please feel free to send an email or call. You can even drop by the office if you would like... just let us know first! protocol 80, inc. An Inbound Marketing Agency your success is our mission.